My latest food shopping adventure has been to buy a new vegetable each week. Lucky for me, the immigrant population in Chicago means that any decent produce store is stocked with veggies I not only have never tried, but I can’t even pronounce. The stores are also full of employees from cultures steeped in home cooking traditions. These folks can name more ways to use a tomatillo than I can a potato. Apparently, what I had was a form of squash. 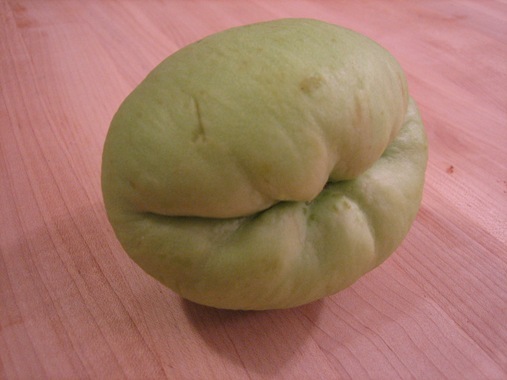 Chayote, to be exact. And here’s what I did with it. Turned out fabulous. Oh–but before I did that, I drew a face on it. Couldn’t resist. Saute garlic, squash, salt, pepper and agave for 2 to 3 minutes. Add vinegar and cook 2 to 3 minutes longer, until the squash is slightly wilted, but still firm and crunchy.